Wolf Commercial Real Estate, the foremost Voorhees commercial real estate broker that specializes in Voorhees commercial real estate listings and services, now is offering prime Voorhees medical space for lease at 134-136 Route 73 Voorhees NJ. This medical space in Voorhees has between 2,000 sf and 25,000 sf of newly constructed “Class A “space. This Voorhees medical building for lease at 134-136 Route 73 Voorhees NJ is ideal for medical or professional uses. The asking lease price for this medical space in Voorhees is $28.00/sf NNN. This Voorhees medical space for lease is across from the Voorhees Virtua Hospital Campus as well as PowerBack and Genesis Health Care. Leasing arrangements for this Voorhees medical space for lease are being handled by Wolf Commercial Real Estate, a Voorhees commercial real estate brokerage firm with expertise in Voorhees commercial real estate listings and services. This Voorhees medical building for lease at 134-136 Route 73 Voorhees NJ has a dynamic modern design and there’s a 5/1,000 sf parking ratio at this Voorhees medical space for lease. Located along Route 73 along what is becoming known as “Medical Row,” this medical space in Voorhees has easy access to I-295 and the New Jersey Turnpike as well as convenient access to the Atlantic City Expressway. There also is great visibility to this Voorhees medical space for lease with +/- 50,000 cars a day passing by this Voorhees medical space for lease. This medical space in Voorhees has monument signage available. This Voorhees medical building for lease is being represented by Wolf Commercial Real Estate, a Voorhees commercial real estate broker that specializes in Voorhees commercial real estate listings and services as well as medical space in Voorhees. Nearly 133,000 people live within five miles of this medical space in Voorhees. 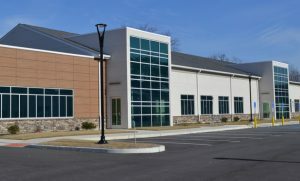 The average annual household income within the same radius of this Voorhees medical space for lease is nearly $99,000. In addition, the average house value within five miles of this Voorhees medical space for lease at 134-136 Route 73 Voorhees NJ is just below $350,000. For more information about this Voorhees medical space for lease at 134-136 Route 73 Voorhees NJ or about any other Voorhees commercial properties for sale or lease, please contact John T. Mozzillo (856-857-6304; john.mozzillo@wolfcre.com), Christopher Henderson (856-857-6337; chris.henderson@wolfcre.com), or Jason Wolf (856-857-6301; jason.wolf@wolfcre.com) at Wolf Commercial Real Estate, a Voorhees commercial real estate brokerage firm. Wolf Commercial Real Estate, a full-service CORFAC International brokerage and advisory firm, is a premier Voorhees commercial real estate broker that provides a full range of Voorhees commercial real estate listings and services, property management services, and marketing commercial offices, medical properties, industrial properties, land properties, retail buildings and other Voorhees commercial properties for buyers, tenants, investors and sellers. Please visit our websites for a full listing of Voorhees commercial properties for sale or lease through our Voorhees commercial real estate brokerage firm.